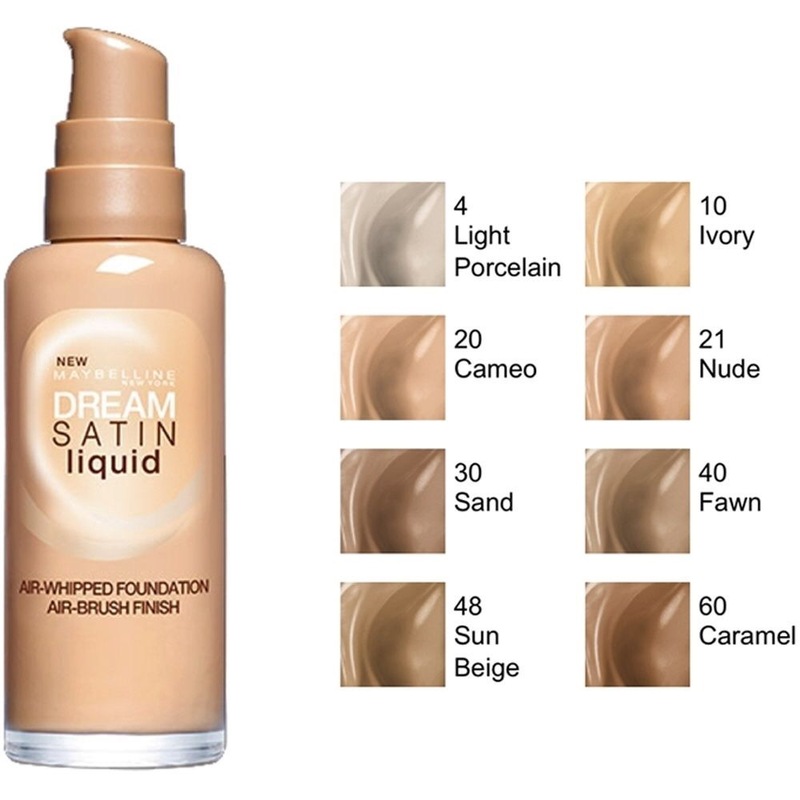 Hello everyone, today I bring you maybellines dream satin liquid foundation. I have been using this for a couple months now and feel ready to give you a good run down of what I like about this foundation. First of all my colour is light porcelain which is darker than the picture above, but the lightest shade in the collection. My skin is dry to begin with and will produce more oils during the day which makes my makeup struggle to stay still. I also break out in blemishes very often like most of us girls do, therefore I need a good coverage foundation. I will first start with the cons of the foundation, number 1 is that my shade is the lightest and I still find some days it seems a little dark, and my skin isn’t very white I do have a little tan left from the summer, therefore this foundation may be a little orange for those of you with a really pale complexion. And lastly I do find it a little bit on the thick side making it a little difficult for application. I have found when apply this foundation a sponge or beauty blender works best, I tried with my real techniques brushes and I found the foundation left streaky marks across my face, where as the beauty blender when damp applied the foundation evenly, and covered the blemishes on my face well, however the product did get soaked into the beauty blender a lot which means I am wasting foundation, but I haven’t found a better way to apply it. My real test with foundation is whether it will last a shift at work. Some of you may know I’m a nurse therefore I need a good foundation which can deal with the hot ward and as horrible as it is to say sweat. I do 7.5 hour shifts sometimes 12 so I tested the foundation with and without primer. Without primer I found after 4 hours the foundation on my forehead, and chin started to become blotchy and begin to slide. This is with powder on as well, so I didn’t get much luck. However I have recently started using benefits porefessional as a primer and have found that the foundation lasts about 6 hours longer, looks less blotchy and does begin to move a little but not as bad as it was without the primer. Now I always use a beauty blender, primer before, and powder to set after. I will keep using it but I wouldn’t recommend this foundation for a night out or for longer than 6 hours as it begins to move and will come off easily, however for a product that is only worth £7.99 in boots I would really recommend this product to people who cannot afford the branded items. Please leave comments below of a really good drug store foundation that you have tried and loved, I am always looking for new ones. I love the Bourjois healthy mix! Haven’t used it in a while since discovering l’oreal true match! I love both, need to revisit the Bourjois one and find it once and for all which foundation is my holy grail! Definitely feel you should check out Bourjois! Great high street brand! Thanks to my skin care products, I am foundation free! Just use a light mineral powder coverage! Thanks for sharing this review:) Have you tried the Loreal Infallible foundation? I hear it’s good!